Roger Mansell, our founding publisher, president of the board of the Tameme foundation, has passed away. Review of the chapbook An Avocado from Michoacán / Carne verde, piel negra by Agustín Cadena en Pluma Fronterizo blog. A talk by C.M. Mayo at the Feria Internacional del Libro in Guadalajara, Mexico: "In Celebration of Literal: Latin American Voices / Voces Latinoamericanas"
Letter from the editor to writers and translators. 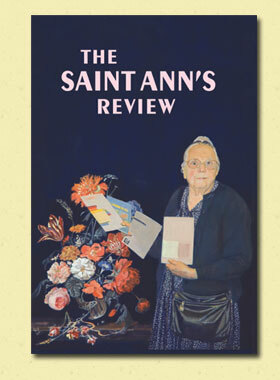 St Ann's Review editor Beth Bosworth interviews editor of Tameme, C.M. Mayo; poem by Jorge Fernández Granados translated by John Olver Simon reprinted from Ghosts of the Palace of Blue Tiles / Los fantasmas del palacio de los azulejos. 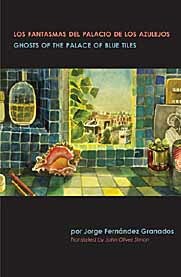 "The poems are filled with images of Mexican culture and its ancestral customs and traditions. Cultural images are interwoven and enriched with nature, life, and death; an air of the supernatural world surrounds the fragility of human existence.... This poetry belongs in all library collections and will be appreciated by poetry lovers interested in modern Mexican poetry and culture." Interview with C.M. Mayo by Rigoberto González in the "Critical Mass" the blog of the National Book Critics Circle. Tameme estará presente en la Associated Writing Programs Bookfair que se celebrará en la ciudad de Nueva York en febrero de 2008. Tameme will have a table at the Associated Writing Programs Bookfair in New York City this February 2008. New interview with the Mexican poet Jorge Fernández Granados and a poem (with John Oliver Simon's translation). New interviews with John Oliver Simon, Agustín Cadena, and C.M. Mayo. The El Paso Times's Rigoberto González gives Tameme a glowing review. Interview with C.M. Mayo in the Quarterly Conversation. The first Tameme chapbook, "Carne verde, piel negra ~ An Avocado from Michoacán" by Agustin Cadena (translated by C.M. Mayo). A story by the winner of Mexico's San Luis Potosí Award for the Short Story. English and Spanish side-by-side. Includes an interview with the author and translator's notes. 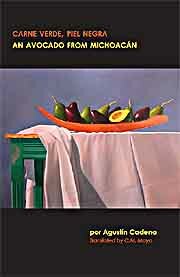 Cover painting: "Avocados" by Edgar Soberón. For more information, click here. With Tameme Chapbooks ~ Cuadernos, Tameme, Inc. is now refocusing its mission on celebrating and disseminating writing from Mexico in an attractive and affordable format.